Kei Ito is a U.S. based photographer and installation artist who graduated from Maryland Institute College of Art (’16) with an MFA in Photography, following his BFA from Rochester Institute of Technology (‘14). Kei’s work addresses issues of generational connection and deep loss as he explores the materiality of photography as a medium. His recent work deals with the tragedy and legacy passed on from his grandfather who survived the atomic bombing of Hiroshima, yet died from cancer, and the threat of nuclear disaster which is still present today. His photo-based installation takes the audience on a journey of grief, remembrance, and hope. Through his ritualistic image-making, the audience may see how his family history grapples with the legacy of nuclear weapons and power. Thus, his art serves as an intermediary between the heritage of Kei’s grandfather and today’s nuclear climate as a memento. Kei’s artistic vision has been recognized by various awards and institutions such as the Manifest One Award(OH), the Rubys Artist Project Grant(MD), the Snider Prize(IL), and Awards for Innovations in Imaging(LA). His works are in the permanent collections of institutions, including the Museum of Contemporary Photography in Chicago and Norton Museum of Art in Florida. 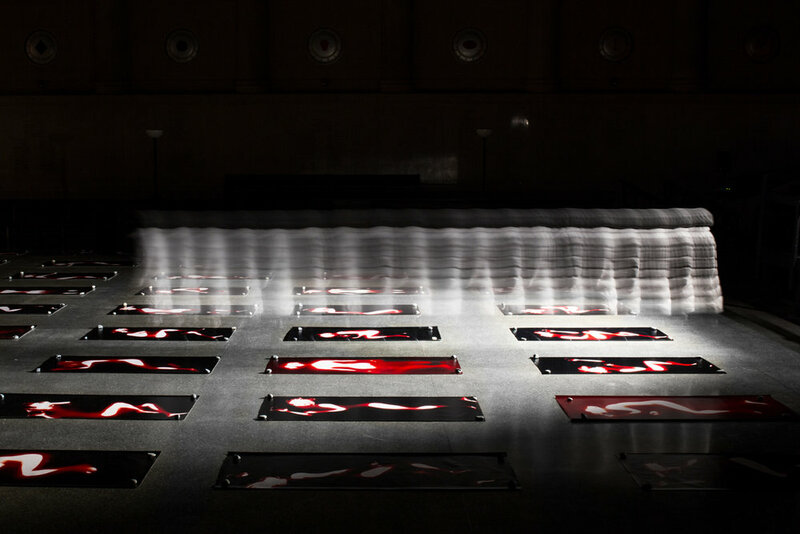 His most recent large-scale installation project, Afterimage Requiem, has been reviewed and covered by major media outlets such as the Washington Post Magazine, the Baltimore Sun, and BBC World News. AH: Thank you for agreeing to speak with me about your newest body of work “Afterimage Requiem.” I am very excited to share your work on Strange Fire. You collaborated with Andrew Keiper on this series and it seemed to unfold in a strangely organic way. Can you talk about how the project got started and the conversation you had that led you to collaborate? KI: When I was accepted to the Maryland Institute College of Art’s graduate program in photography, I needed to find housing. Andrew was the first person to respond to my call and actually the first person I met in Baltimore when he picked me up from the airport. From the beginning, we kicked it off fairly well. After a few days, in the lounge we were talking about art and influences; I mentioned about my grandfather and his experience of witnessing the A-bomb exploding in Hiroshima and me seeing him die of cancer when I was nine years old. The whole room went quiet. And with wide open eyes, Andrew said, “my grandfather worked on the Manhattan project as an engineer during WWII.” After living together for two years and going to the same program, we were thinking about some sort of a collaboration which we then applied to the Baltimore based artist grant called the Rubys Artist Grant which we received. AH: You traveled to New Mexico with Andrew and visited the site where the first atomic bomb was developed and tested. What was that experience like for the two of you? KI: Los Alamos is the birthplace of the a bomb, so it was natural that it had significance for Andrew as his grandfather was the one who worked on the Manhattan Project. The biggest part of traveling to New Mexico was to do research and also for Andrew to take a field recordings in the land that the A-bomb was created. However, it gave me a great experience of visiting the birthplace of the destruction that my grandfather witnessed. I specifically remember touching the old wood in Los Alamos knowing these pieces of wood witnessed and consumed the light of the first A-bomb. These silent witnesses still stand, marking the birth of the end. AH: How did the sound component come together and how does it affect the way people experience the work, especially in the setting of the Baltimore War Memorial? KI: It is a 4-channel sound piece where sound changes as you move around within the installation. The front side of the exhibition mostly contains natural sounds taken from Los Alamos and as one goes into the exhibition, you would hear more machine based factory sounds, including Geiger counter sounds. Since Andrew had been exploring drone music, a type of experimental music that emphasizes sustained and repetitive sounds, the sound he created for the show is meditative yet tense. Shown together with the 108 life-sized photograms in the high ceiling space such as the Baltimore War Memorial, brings an almost like shrine atmosphere. AH: Your grandpa’s experience during World War II has inspired a lot of your work. How did this family narrative direct your focus as an artist? KI: One of the most vivid memories I have of my grandfather talking about Hiroshima was when he said that “day in Hiroshima was like hundreds of suns lighting up the sky.” This statement has led me to my signature technique of using sunlight to create cameraless photographs. One important thing about my artwork is it is an artwork heavily based on my grandfather’s experience but it is a gateway to talk about the ongoing contemporary nuclear issues we are facing right now. AH: Can you talk about your process and how the physicality involved in creating the photograms is both metaphorical and ritualistic? KI: Specifically for this project, I believe when my grandfather witnessed the a-bomb exploding, the radiation [what I call the Invisible Light] pierced through my grandfather’s skin and onto his genes, inscribing itself and turning him into a film that captured the light. Those genes and light were passed onto me and now I am using my body as a film exposed to the sunlight leaving shadows on the light-sensitive paper. Repeating it for 108 times has a ritual significance in Japanese Buddhism, a number that embodies redemption from evil passions. Each time I expose myself on the paper, I struggle from knowing the suffering of my grandfather and the current political climate as the doomsday clock is ticking to the midnight, though every time I expose myself on the print, I find more hope in the future. AH: I have never read your work as a historical dialogue. It feels like a dire warning of how often history repeats itself if we don’t actively work to make a change and give transparency to historical events. Can you connect the dots for our readers and talk about some of the current political issues happening in the U.S. (or beyond) and why we should be concerned about them? KI: As the Doomsday clock is only two minutes to midnight, the threat of nuclear war is as close as the Cold War when both the US and Russia tested the H-bomb. The tension between the US and North Korea rises and I see in the Japanese news that North Korea launches missiles to the Japanese seas daily. This collaboration reminds the audience that our experiences today are not too different from the past. The War Memorial manager told me that this exhibition would have never happened ten years ago because of the attitudes towards the subject was more closed and one-sided. It truly portrays the contemporary shift in people's mind that a collaboration between an artist who has a grandfather who witnessed the A-bomb exploded and a sound artist whose grandfather participated in the creation of the a-bomb are possible at the Baltimore War Memorial. AH: You're able to reach people on an emotional level through the story of what happened to your grandfather. You’re connected to a personal, family narrative that many people would choose to keep buried. Did your grandfather share his story and encourage you to talk about it or is it something you had to work to bring to the surface? KI: It is really a combination of my memory of my grandfather and intensive research I do for every project. Including meeting my grandfather’s friend who was also present in Hiroshima when the bomb was dropped. I was fortunate enough to meet him in Hiroshima, two years ago, where he told me that there exists no words that could describe what it was like to be in Hiroshima that day. AH: I believe that trauma is passed down through generations and that we have a responsibility to try to uncover, engage, and respond to it. Just as we are inclined to repeat history if we never learn from it, trauma never stays buried and boils to the surface when our guard is down. Do you think your work has helped you to understand, and perhaps even come to peace with what happened to your grandfather? KI: As an artist who lives in America and has lived here for almost half of my life, I am very aware of both sides of the conflict. The collaboration with Andrew, and even showing at the Baltimore War Memorial was a huge step for me to explore the complex context of this history. I suppose you could say, I am still exploring that and will be searching for new ways of coming to terms with it. I believe art is an initiator for discussion like a seed that you plant in people’s mind that hopefully, eventually, inspires to be a larger movement to change the world. There were many people who came to the exhibition, some were actually part of an anti-nuclear activist group, some barely knew anything about nuclear weaponry, but they all experienced something together entering the artwork; a collective experience, one not divided by nationality. Moreover, we have been getting coverage from the world wide media outlets from the Washington Post magazine to BBC World news, that gives me hope that art can reach out beyond the exhibition space. AH: The online exhibition and future billboard project “Atomic Traces,” (https://atomictraces.com/) curated by Liz Faust, that you are involved in had to jump through hoops after being censored by a billboard company in New York for being "too political.” Can you talk about other resistance you may have faced and can you give any advice to our readers on how to keep going and be able to reach the audience that might need to experience their work the most? KI: I believe art is the very platform that allows both artists and the audience to be able to discuss and understand some of the hard to swallow political issues that people are facing. It is the nature of these kinds of artwork that draws attention of the entire spectrum of people who support you and oppose you. However, we need to remember if the art can’t be the medium to be able to talk about these things, our society becomes less open and free. AH: It is so great to see your work receiving media coverage and propelling a dialogue forward. What’s next for you? KI: As for Afterimage Requiem, we are planning to travel the show across the country. There have been a few offers by different venues, both historical and art venues. We are pretty excited to bring this work to various audiences. Also, there are a few projects I have been meaning to make including a project regarding pop media’s portrayal of mutation caused by radiation. I have been in touch with several organizations regarding both nuclear issues and interests in Japan which I hope will inspire future projects. AH: Thank you so much for taking the time to talk to me and sharing your work Kei!